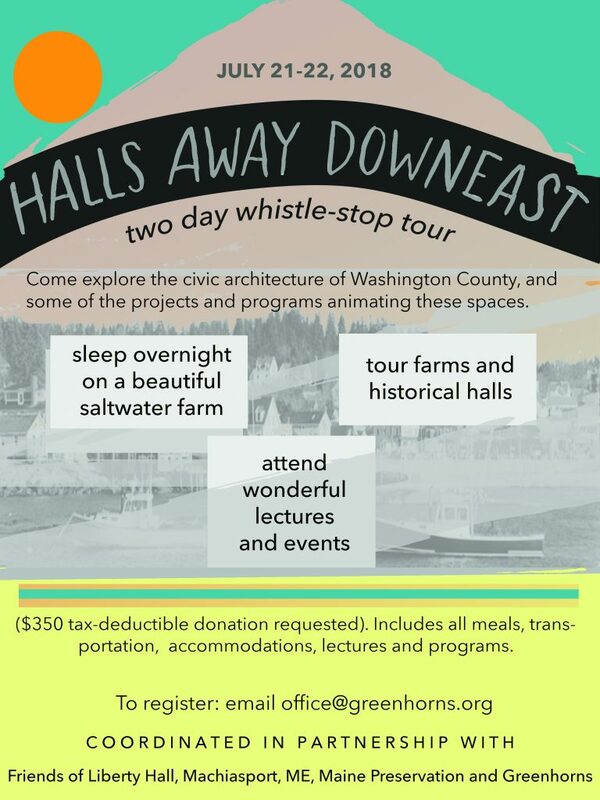 Join us on July 21-22 as we present a tour of the civic architecture of Downeast Maine in partnership with Friends of Liberty Hall, a newly restored hall in Machiasport Maine. Along with other partners and presenters we will proceed from Ellsworth IOOF across Franklin, Cherryfield, Columbia Falls, Mahiasport, Machias, Dennysville, Pembroke, Perry and Eastport visiting halls, granges, churches, taverns, school houses and other historic or revived community infrastructure along the route with a series of local interpreters. Attendees will learn about the work of the Downeast Salmon Federation and the Tides Institute, with a presentation about local food networks and Grange Hall restoration in Machias, a lecture about fisheries history in Eastport. We will be sleeping overnight at Tide Mill farm, an organic family farm that has been run by the same family for 9 generations! The tour delivers guests door to door all aboard the West bus, all meals and lectures are included. Washington County is host to extraordinary terrestrial and aquatic wealth which formed the the basis of powerful 19th century extraction economies ( lumber, fish). The communities who benefited from these resource based economies in turn used that wealth built outstanding social structures. The beautiful halls are irreplaceable yet endangered relics of this era, and are now part of our legacy to protect, adapt and re-imagine. These halls have such potential! Community efforts to date have kept these halls in good roofs and gutters. However, like small towns around the country Grange-revival and relevance comes from functioning kitchens, microphones, and activities that keep people engaged and sustaining these buildings can be expensive! There are existing grants from Maine Community Foundation, and other sources which can help non-profit and private projects. Renovations often emphasize restoration of kitchens, performance/office/community meeting space, and new uses for old buildings. Founded in 2006, the Friends of Liberty Hall are dedicated to returning a major historic building to its former glory and making it a focal point for community prosperity through the fostering of activities related to the site’s unique cultural, artistic and environmental history. Overlooking the site of the first American naval victory of the Revolutionary War, and built as the Town Hall of Machiasport in 1873, Liberty Hall is one of the finest examples of civic architecture in Maine. From the outset, the Friends have been actively working with local people and seasonal residents to raise funds to secure the building. In this way they have facilitated an ongoing, expansive discussion about the future use of Liberty Hall. Between 2006 and 2008, almost a million dollars was raised through government grants, private funds and individual donations to return a precarious and derelict structure to its former glory. Two phases of a four-phase restoration project have been completed. The remaining tasks include the repair of the rear of the building and the full interior restoration. Given its location on the edge of the Machias Bay, with its distinctive archaeological, environmental and historical character, and its unmatched size and capacity for meeting and theater space, Liberty Hall is a major resource that promises to benefit not just the immediate surrounding towns but populations across Washington County. Location: Meet 8 am at the historical society Northeast Harbor or mid morning in Ellsworth. RSVP required, limited spaces – email office@greenhorns.org asap to reserve your space now!